"People with atrial fibrillation are at a higher risk of developing blood clots, which can cause a disabling stroke if the clots travel to the brain," said Norman Stockbridge, M.D., Ph.D., director of the Division of Cardiovascular and Renal Products in the FDA’s Center for Drug Evaluation and Research. "Unlike warfarin, which requires patients to undergo periodic monitoring with blood tests, such monitoring is not necessary for Pradaxa," Stockbridge says. 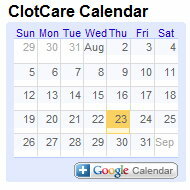 Note from ClotCare Editor: You may also want to review the related posting at clotcare.org/fda_recommends_dabigatran_approval.aspx.